- Can they do it? Could the Saskatchewan Roughriders take down the juggernaut known as the Calgary Stampeders Sunday afternoon at Mosaic? Many will say no way, and they'd be justified seeing the Stamps have won eight in a row. If these two teams were playing in Calgary, EVERYTHING would have to go right if the /=S=/ were to be victorious. It might be another story here though. The Riders are a different team at home as they are energized by a raucous home crowd which makes life difficult for the opposition. That crowd should be even more insane than usual when Bo Levi Mitchell and company take the field. This should be the game where TSN has its decibel meter going! If the 13th man can bring it and then some and make life miserable for Bo Levi and company right off the bat and keep that going throughout the game, the Riders have a chance. The medical report came back favourable so a lot of guys who were wounded in Hamilton should be back. The Stamps will have their fair share of injuries. They will be favoured, and they should be, but if home field advantage was ever needed by the guys in green, it will be Sunday. Are you up to the challenge? Somehow, I think you are. - The news from 3 Down Nation's Drew Edwards on the Ottawa-Montreal game last week drawing only 190,000 fans as it went head to head against Sunday NFL wasn't a surprise. Why would anyone want to watch two Eastern teams sludge their way through 60 minutes when the NFL was on. I certainly didn't watch and neither did many by the looks of it. What did surprise me was more people watched an NHL pre-season, Formula 1 and NASCAR. Edwards then goes on to report numbers are down 13 percent from last year. Some advertisers did jump on board this year, but Wendy's and RONA decided to cut bait. This should be very worrisome for many. The league has to seriously look at going head-to-head with the NFL especially when TSN is showing NFL games on a Sunday as well. They own the rights so they will do it. If Sportsnet had them, it would be the same thing with the same numbers. While the numbers are a bad for the CFL, the fact they have launched a game for your phone is a plus. Look for CFL Frenzy and have fun with it. The game will come out for Android in a couple of weeks so I'll have to wait. - The Regina Pats team who takes the ice tonight in Brandon won’t be the same Regina Pats team that takes the ice against whoever in the opening game of the Memorial Cup in May. The Pats begin the road to the Memorial Cup which will end at the Brandt Centre without the likes of Sam Steel, Nick Henry, Jake Leschyshyn and Josh Mahura as all are either hurt or at NHL camps. As I have stated before, if you are thinking this Pats team will be as good as the one last year, you can think again because a 52 win season is improbable. I can see this team trying to hold its head above water until the trade deadline when John Paddock will do what has to be done to make his team a viable contender for both the Ed Chynoweth Cup and Memorial Cup while attempting to keep the cupboard somewhat stocked so that playoff runs can be achieved and they are not a bottom-feeder as was the case after the last Memorial Cup here when it took forever for the team to be competitive on a night-after-night basis. It is going to be a great ride this season watching Paddock’s proteges do their thing, and with this being the 100th season of Regina Pats hockey, it will be one to celebrate and one to remember. Can’t wait for the puck to be dropped and see guys like Jeff DeWit, Bryan Lockner, Tyler Brown and Dawson Davidson amongst others do their thing. - If you are going to the Pats game Saturday night, may I suggest checking out the Rams as well. They will play Manitoba at 2 o’clock at Mosaic. 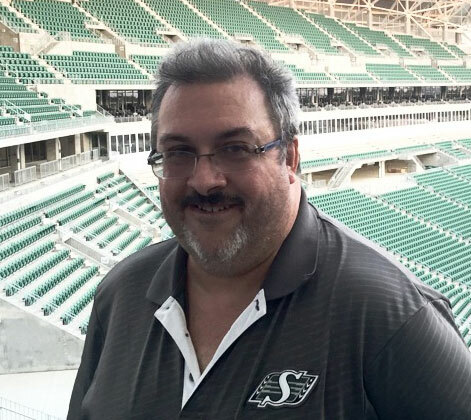 As Rob Vanstone correctly stated in this week’s “Robservations”, “Why is it the Rams can’t draw more people in a supposedly “football-crazed” city? The same goes for the Thunder! It’s not as if both teams are bad either because they are definitely not. - The "Hockey News" is picking Pittsburgh to beat Edmonton in the Stanley Cup Final. The Oilers back in the Final? That would be somewhat delightful for this blogger. - Whoever runs the Vegas Golden Knights Twitter account is wayyyyyy too smart for that job. It is the best sports Twitter account out there today and the gap between first and second is a wide one. - The Blue Jays signed Marco Estrada to a one year, 13 million dollar deal. Yes, Estrada pitched much better in the 2nd half of the season, but is Marco Estrada the answer to getting back to the playoffs on a one year deal? I really don't understand what Mark Shapiro is doing, and I'm thinking the average Blue Jays fan is wondering that as well. At least after next week, they shouldn't have to worry about Jose Bautista anymore. What a grand decision it was to bring him back for a year when no one else wanted him. - I can't forget about offering a hearty congratulations to Wes Cates and Roger Brandvold. Both will go down in Riders folklore by being formally inducted to the Plaza of Honour. It's a great accomplishment for two who helped make the Riders "Canada's Team!" Have a great weekend gents and soak it all in. I'm not sure what's up, maybe it's just me but I'm bored with the CFL between games this year. With one team in the West wining every week. Followed by a horrible Eastern division. Knowing that 2 teams out East will make the playoffs when even the last place Western team (whom ever it will be) is a far superior team is frustrating to say the least. If the CFL really wants to be taken serious in years to come. They have to figure out how to have the best teams in the playoffs. Not some silly line drawn in the dirt. Heck even if they need 3 Divisions. East, Central & West. What ever it takes to eliminate teams below .500 making the playoffs. It's just embarrassing. Kind of like when the league had 2 teams with the same (incredibly similar) names. Only a small space between the words Rough and Rider separated the 2 franchise. Just like our playoff format. Until we start removing the Mickey Mouse effect from the league. The CFL will never be looked at as more than a second rate farm team league. With the CFL head office going dark from December to June. It is so easy for the non loyalists to tune into what is being presented through the media. As well, even during the season. Having only 1 sports network covering the league has probably hurt as well. There is a real potential here to do something with this league. What is needed is someone like new Commissioner Randy Ambrose who is not just a yes man. But a man who has an emotional investment as well. We need our Country sports fans to become emotionally invested in the CFL. Then and only then will we start to see a brighter tomorrow. “Why is it the Rams can’t draw more people in a supposedly “football-crazed” city?" Maybe the Rider crowds have more out-of-towners than Regina folks would care to admit. You are soooo right on the Vegas Twitter account. So funny and sharp! Wes Cates was a workhorse, and a tough one at that. Loved the story he told on the Cage yesterday about his broken foot. Congrats Wes! Regina does thumb its nose at the Rams and Thunder. You can deny it all you want, but if you can put 5 grand into the Brandt Centre for a Pats game, you can put 5 grand into Mosaic for a Rams/Thunder game. Strange how the Pats get as much coverage as the Riders. Nothing to Report? You wonder why more people don't go to Rams and Thunder games? Read point 4, in general Canadians are sports snobs. Why would we waste our time attending or watching Canadian sports. We all know our athletes are inferior to the athletes south of the border. Sad but true part of our Canadian identity. The CFL was smart this year by only having a few Sunday games once the NFL starts. They will never compete with the NFL so don't even try. With only 9 CFL teams, there is no reason why the CFL can't do all their games Thurs, Fri, Sat during the summer and in the fall have a double header every Friday and Saturday. Part of the problem regardless of when OTT plays MTL is that the east teams are just not exciting to watch. Maybe the Argos, and the viewing audience for MTL vs TOR this Saturday will be dismal as well. The largest populations are Vancouver, Toronto and Montreal and they have the 3 worst fan bases. Until the east teams are more competitive it will continue to be an issue. The Rams and Thunder should move their games to Leibel Field once the renovations are complete. Beer gardens, party tents...make it a thing and try to get the students out to the games. Mosaic is a bad atmosphere to watch younger teams in. The drain of TV football watching Canadian begins with marketing. The NFL is simply superb. The NFL shows high profile games not the ones between 2 bottom dwelling teams. Having 30 teams not 9 helps them.CFL needs to get their head out of their butts and stop going head -to-head with the NFL. CFL games used to blow the NFL games out of the water entertainment wise. Most NFL games before were low scoring "2 bucks and a pass" Then the CFL started to change the rules. Penalty flags flew on seemingly every play draining fan interest. Illegal contact for out of the play slight tugs killing a great play has destroyed the fan enthusiasm for the CFL.Suddenly we started seeing great NFL games. Couple that with the hype and you have the current situation. Frankly I don't have much interest in watching a Montreal/Hamilton, Toronto/Ottawa, Edmonton/Winnipeg flag fest anymore. If I wasn't a rabid Rider fan I wouldn't watch any. Sadly my son has given up even watching the Riders. Not sure how to bring back fan interest outside of Riderville. The second thing you know is that the Stamps will beat the Riders. Our athletes are not inferior to those south of the border in any sport. It is just that for every Jerome Messam or Andrew Harris in Canada, there are twenty in the US. It is a matter of quantity, not quality. Once Canada gets to 326000000 people and the same ratio of football players, we will be on the same level. People watch the highest level local team from each sport. It's no secret and it's virtually the same everywhere. Happens in the NFL too dude, are they legit? CIS football, is just not that fun to watch on a regular basis. Simple as that. The last Rams game I went to, I was less tjan entertained. Pretty tough to have decent ratings when the first quarter of the game had technical problems and most people just watched something else. Like the posters on here sub par, compared to our USA friends south of the border. NFL over CFL. It's like why we don't go to a Rams/Thunder game. One is just so much better than the other. I agree with the comment in regards to penalties. I watch a lot of NFL and DB's regularly have their hands on a receivers shoulder or hip and it's rarely called. Unless they are impeding the receivers arms or hands they let them play football, and you rarely see an illegal contact on a receiver call on a play that's 25 yards away from where the ball was thrown. DB's are allowed to go for the ball just as much as the receiver is. So if a DB is going for the ball at the same time as the receiver and they bump there should be no penalty. Betting tip, pick the opposite of scruffy's nfl picks. Guaranteed money.